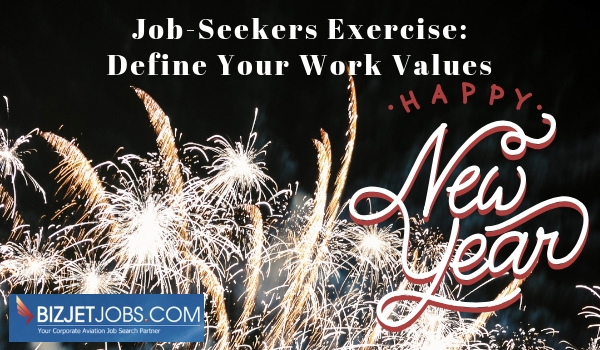 Home > Blog > New Year’s Exercise for Job-Seeking Pilots: What Are Your Work Values? Happy New Year! This is the time of year many of us in aviation celebrate the career goals we’ve met and set plans and goals for our careers for the year to come. Everyone, from Chief Pilots managing a team to those looking for contract work can benefit from this exercise. Instead of focusing on what you want to DO as a corporate pilot in 2019 (which can create anxiety), why not focus on who you want to BE? At BizJetJobs.com, we have found that pilots who have a job and work for a company that lines up with their personal values are much happier and more successful than those who don’t. These are the personal values associated with where you want to live, how you choose to spend your free time, and your long-term life goals. We encourage job-seeking pilots to spend some time writing down ways your top values could be reflected in your ideal job. Keep these values top of mind as you research companies during your job search and use your values as the basis for some of the questions you ask hiring managers at your job interviews. You can also make mention of your work values in your cover letter so likeminded hiring managers take notice. Employers, you’ll want to review these values as well to really understand your corporate culture as a flight department, and what values you prioritize as a company. This entry was posted in Blog, Career Advancement by Amanda Jenkins. Bookmark the permalink.